Keeping the Yearbook Tradition Alive in the 21st Century!!! A picture has the amazing ability to capture the feelings and emotions from events throughout our lives. Because of this, we've come to treasure these priceless memories. Think of all the time spent with friends or loved ones, reminiscing of the moments shared together while flipping through countless pages of photo albums and yearbooks. These memories are meant to be cherished forever and shared with all. So why are children missing out? Why is it that not every child gets a high school yearbook? Enjoying a memory shouldn’t be just for the rich! However, the cost of producing a yearbook is rapidly increasing to the point where many students can no longer afford purchase their school yearbook or elect not to purchase to save money in these tough economic times; our schools are also losing out on fundraising opportunities, which reduces moneys available for books, extracurricular activities or sports. It’s a real tragedy that many students can’t afford their yearbook or that some schools can’t afford to produce a high quality yearbook. 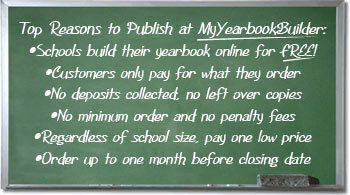 The MyYearbookBuilder publishing system addresses rising costs and ensures that yearbooks remain universally available. Contact Odyssey Interactive today to get started! Start a risk-free, no obligation MyYearbookBuilder evaluation.